California lotto officials tweeted almost immediately after that a winning ticket was sold in the state, although it was still not clear if other winning tickets were sold. The state also tweeted that it sold 12 tickets that matched five of the six numbers. 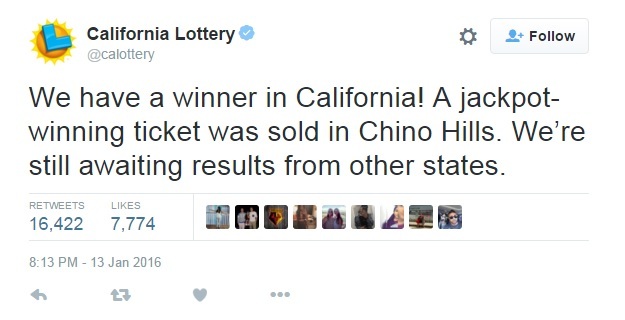 California lottery officials said the winning ticket was sold at the 7-Eleven on Chino Hills Parkway. The jackpot, which reached record levels after 20 drawings without a winner, was estimated to be nearly $1.6 billion. According to the Texas Lottery, the cash equivalent was $983.5 million. This Powerball jackpot first started at $40 million on Nov. 7, 2015. According to Texas lottery officials earlier today, there was an 85.8 percent of the possible number combinations had been sold. Here is a profile of the man in charge of drawing the winning numbers in Tallahassee, Fla. The studio where the ball machines are stored have several security precautions in place. Here are some thoughts from experts about what to do if you are the big winner. Even if you don't get the jackpot, there are plenty of other prizes that will be awarded. There were 28 people that got at least $1 million in the last drawing. Office pools are a popular way of getting shares of more tickets, but there are some potential drawbacks to be aware of. This office pool in Ohio took the venture seriously and not only got a notarized contract but also have a resident good luck charm.